VFDs are used to control AC induction motor speed and torque, while the induction motor is the major equipment in industrial areas. ABB is the global market leader of variable frequency controller and motor areas. Variable frequency technology extends the motor running speed range - from zero speed to above the motor rated speed - to improve the production efficiency of the transmission process significantly. 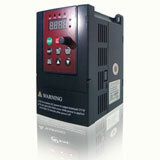 In the case the motor only needs a lower capacity, the VFD can reduce the motor speed to save energy. ABB standard drives are easy to installation, set up and operation, to save a lot of time for you. The VFDs are widely available and can be purchased from all of ABB's distributors, thus it called standard drives. Those drives have common fieldbus interface, processes, specifications, design, debug and maintenance. ABB Air-cooled ACS 2000 VFD drive is dedicated to the cement, mining, metallurgy, pulp and paper, water supply, electricity and chemical, oil gas etc, for the fans, pumps , compressors , and other common applications. ABB ACS 2000 drives combine with innovative technology to address the industry challenges , such as the flexible power supply connections, lower harmonics, reduce energy consumption, SVC (Static Var Compensator) and easy installation, debugging. ABB ACS 2000 VFD drives can be without using the input isolation transformer, depending on user’s choice and the existing equipment situation, thus allow the variable frequency drive connects to the power supply directly (direct power grid connection), or can be connected to a input isolation transformer. In direct power grid connection configuration mode, clients can benefit from the lower investment cost due to there is no transformer. Compare with other VFDs which need transformer, ABB ACS 2000 drives have more compact design, lighter weight, lower transportation costs, and need smaller installation space. ABB ACS 2000 drives integrated Active Front End (AFE) technology, without using expensive and dedicated transformer, ACS2000 VFD can minimize the power grid harmonic, and with additional four-quadrant operation and reactive power compensation benefits. AFE provides low harmonic to meet the various criteria for current and voltage harmonics requirements. Thus, there is no need for harmonic analysis or installing a line filter. In order to achieve minimize energy consumption, AFE allows four-quadrant operation to make braking energy back to the power grid. AFE also can provide reactive power compensation. With SVC, the VFD can maintain a smooth voltage characteristic, and avoid the reactive power punishment. With direct power supply connection technique, to allow the VFD installation and commissioning work faster and more convenient. Installing a VFD, simply use ABB "three in - three out" wiring concept, disconnect the direct power supply running and connect to the VFD, then connect the VFD to the AC motor . ABB ACS2000 drives were designed with withdrawable phase module for quick replacing all of the VFD's components from the drive's front side, the mean time to repair (MTTR) is in leading level of the whole industry. ABB ACS 2000 drives adopt multi-level voltage source inverter (VSI) topological structure, mature high voltage IGBT power semiconductor technology and Direct Torque Control (DTC) motor control platform. Therefore, ACS2000 VFDs have high reliability, extend the mean time between failures (MTBF) and increased utilization. ABB ACS 2000 VFD inherited the VSI topological structure and uses a patented IGBT-based multi-level design, provides near-sinusoidal current and voltage waveforms, makes the VFD compatible with standard motor and cable. ACS 2000 VFD's control platform uses ABB's award-winning DTC platform, which provides maximum torque, speed performance and lowest energy loss which never happened in medium voltage variable frequency drives. In all conditions, the VFD's control is quick and smooth. Flexible power supply connection, lower harmonics and power consumption, easy installation and commissioning reliability to make ABB ACS 2000 drives have a low total investment cost throughout it's service life cycle. ACS510 VFD is ABB's another outstanding low voltage AC drive. ACS510 VFD has easy installation, configuration and operation to save a significant time. ABB drives are used in industrial areas, ACS510 VFDs are especially for fan and water pump drive, the typical applications include constant pressure water supply, cooling fan, subway, tunnel fan and so on. Perfect match with fan pump. Enhanced PFC application: Control up to 7 (1+6) pumps, it's able to switch more pumps. SPFC: loop soft start function, each pump can be adjusted in turn. Multi-point V/F curve: freely definable 5 V/F curves for flexible applications. PID regulator: Built-in two separate PID controller, PID1 can set two parameters, PID2 can control an independent external valves. Intuitive features: noise optimization, when the drive temperature reduced, increase the switching frequency, control cooling fan starts only when needed, can be distributed switching frequency randomly, thus reducing noise, improving the motor noise greatly and improve effect. Magnetic flux optimization: reduce the motor magnetic flux automatically when the loads decrease, and reduce energy consumption and noise significantly. Connection: easy wiring, simple install, and can be installed side by side. EMC: For the first and second environment RFI filters as standard VFDs, without using additional external filters. Reactor: swinging chokes, match inductance depending on different loads, thus suppressing and reducing harmonics and reduce total harmonic. For 0.12-2.2KW squirrel-cage motor's speed and torque control. As one of Comp-AC family, ACS140 enriched ABB drives. Despite its small size, it contains a number of high-performance transmission's features. It is very suitable for gases, liquids, solids handling processes, typical applications include: packaging machines, washing machines, blender, conveyors, pumps and so on. ABB ACS140 drives have maximum design reliability. OEM distributors can choose cooling mode freely. For flange-mounted, the module generated heat will be dissipated outside the enclosure directly. To further enhance the drives reliability, the number of module's components has been minimized as much as possible. ABB ACS140 drives output frequency is sensitivity to follow the given signal changes. The average accuracy is better than 1%, fast response, with an average delay time of less than 9 mm. Small size, light weight, easy to install and use, suitable for 0.12-2.2KW ordinary squirrel cage motor's speed control. Convenient installation: DIN rail mounting, flange-mounting and wall-mounting. Stable speed adjusting performance, strong overload capacity, low-speed with high torque output. Install additional input filters can reduce the pollution to the power grid. ABB ACS400 VFDs are in 2.2-37KW power range, the maximum benefits are energy conservation, accurate control, safe and reliable, use aluminum and plastic parts to ensure the VFD sufficient precision, ACS400 VFDs main power supply is 230-500V 50/60Hz, control power is 115-230V. Adopt the latest IGBT technology in excitation, the magnetic field voltage does need to match the transformer, magnetic field line fuses and reactors have also been integrated in ABB DCS400 module. As the magnetic field using the three-phase line supply, and get power from the three-phase power supply directly, thus DCS400 VFD does not need a separate field power line. ABB DCS400 drive has a variety of debugging tools. Setup parameters under the guidance of the Commissioning Wizard, plus with self-optimization debugging process, DCS400 VFD's typical debugging time is 15 minutes. Assistant Control Panel, 11KW VFD and blow power drives built-in brake chopper as standard. Start wizard - guides the user to set parameters without entering to the drive's parameter list. Diagnostic wizard - active in fault situation, which will help to find the VFD's faults quickly. 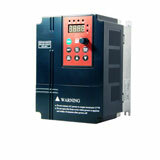 Maintenance wizard - monitor running hours or motor rotation. FlashDrop - transmission setting and speed adjusting is more quickly and easily, can be used for volume manufacturing. Meet the needs of a wide range of machinery applications, such as food & beverage, material handling, textile, printing, rubber & plastics, and woodworking machinery etc. FlashDrop - transmission settings and speed adjustment are more quickly and easily, can be used for bulk manufacturing. Sequence programming - standard logic programming, decrease the requirements of external PLC. Software - high-tech, high performance, high flexibility. Transmission protection - protect the transmission with the best quality latest solution. The biggest advantage of ABB ACS800 VFD is using the same control technology in the whole power range drives, such as starting wizard, custom program, DTC control, common parts, common interface technology, and the common software tools for the VFD selection, commissioning and maintenance. The core technology of ABB ACS800 VFD is direct torque control (DTC), which is the most advanced AC induction motor control method currently. The outstanding performance and stability of DTC make the ACS800 drives are suitable for a variety of industrial fields. ABB drives is continuous improvement in user interface. Startup Wizard makes ACS800 VFD debugging becomes very easy. Compare with traditional parametric programming, ABB ACS800 VFD's custom programming has better adaptability. As a standard configuration of all range drives, it’s like the drive built-in a small PLC, and do not need to add any additional hardware and software. As standard component, ABB ACS800 VFD has built-in reactor. In addition, you can install additional three modules in ABB ACS800 VFD: I/O extension modules, fieldbus adapter module, pulse encoder interface module or PC interface module. For these modules, no need additional space and cable. ABB is the business member of ICC (International Chamber of Commerce) sustainable development, ABB drives follow the 16 provisions of the ICC, and follow the ISO14001 standard in the production process. ACS1000 high voltage VFD is for 310-5000KW motors speed and torque control, voltage rating of 2.3, 3.3 and 4.16kV, this drive has excellent speed and torque control characteristics. ABB ACS1000 VFDs have a variety of flexible combination options to suit a variety of new or renovation projects with different requirements. Minimize interference to the existing equipment and power grid. Using ABB's patented DTC (Direct Torque Control) technology, ACS1000 series VFD provides precise process control, DTC can provide the most rapid response for any motor torque control platform. Without using encoder, it can guarantee the best control precision even if the input power changes and load sudden changes.